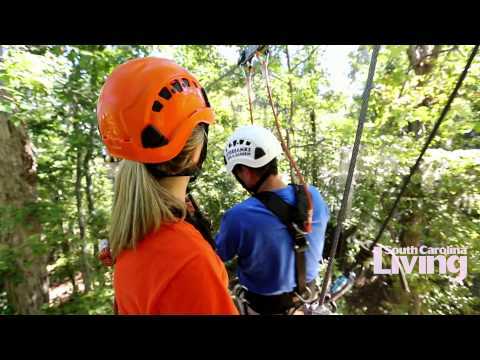 Take a ride on Riverbanks Zoo's newest attraction, the zip line canopy tour. Riders travel above the Riverbanks zoo and grounds on cable lines that run from one treetop platform to the next. Legs tucked up, the zip line tour guide demonstrates proper form for gliding over the beautiful Saluda River. Chelsea Padgett gets an assist from one of the zip line guides to land safely on the last platform of the ZOOm the River course. This zip line rider aims feet first for the second platform, where his group is waiting to tackle the next stretch of the course—a swinging bridge. Whooshing through treetops, gliding above the Saluda River, and making the pedestrians below stare up enviously at you is two hours well spent. Some guests climb down from the final platform, wide-eyed and exhilarated, pumped to do it all over again. “We’ve had older people come out to take it off their bucket lists,” says Susan O’Cain, communications specialist for Riverbanks. The higher intensity ZOOm the River! course features three zip stretches—two short warm-ups, then one 1,010-foot zoom over the Saluda. A couple of cargo net climbs and a swinging bridge complete the adventure. The Zip the Zoo! course runs along the edge of the zoo’s Carousel Plaza. It’s a good starter course for kids and beginners, with four shorter zip stretches and a few climbing elements to add a bit of challenge. Zipping is as simple as sitting down. You’re in a shoulder-to-thigh harness, hooked to an overhead cable line, so all you need to do is relax into the harness—and step off a treetop platform. The tree-mounted platforms do have a bit of wobble, but at all times, riders are safely harnessed and tethered to an overhead line or a sturdy structure. Even on the most daunting section of the river course—a bridge made of swaying planks, suspended by cables, that guests walk across single file—the harness and tether offer plenty of security. Because Riverbanks is part garden, protecting its trees is a priority. Platforms are suspended around the trees using halo structures that minimize damage and allow for healthy tree growth. No question about it—the star attraction is the final and swiftest stretch of the course, where the rider bursts out of the trees and over an open expanse of the Saluda River. The incomparable view and the breeze on your face as you soar over the water are treats enough. Getting to wave at curious onlookers on the bridge over the river or in kayaks below is a bonus. Two trained guides travel the full course with riders. Listen to them—they’re full of handy tips for important things like how to land Peter Pan style or how to tuck your legs up to zip faster. And they’re good for wacky suggestions for ramping up the fun—whoop like a siamang ape, for example, or high five a tree leaf on your way down the line. Riverbanks Zoo and Garden is located at 500 Wildlife Parkway, Columbia, just off I‑126 at Greystone Boulevard. Hours: The zoo is open 9 a.m. to 5 p.m. advance reservations are required for the zip line tours. allow two hours at the zoo for the experience. Cost: Zip the Zoo! is $45 for the general public, $30 for zoo members; ZOOm the River! is $55 for the general public, $40 for zoo members.